The government will officially reopen Monday afternoon after a three day tantrum from Democrats over DACA. Just before 1 o'clock, Minority Leader Chuck Schumer made the announcement Democrats would vote in favor of reopening. The final tally was 81-18. But new polling from Harvard-Harris shows Democrats following Schumer's lead to shut down the government on the issue of illegal immigration was wildly unpopular among the majority of Americans. When asked, "Would you favor or oppose Democrats voting to shut the government down if the continuing budget resolution does not include restoring so-called DACA work permits for undocumented immigrants brought here illegally by their parents?" 58 percent of voters responded with "oppose." Polling also showed a majority back White House priorities on ending the Diversity Visa Lottery Program, eliminating chain migration and building a border wall. What's next for the illegal immigration and DACA debate is to be foreseen. 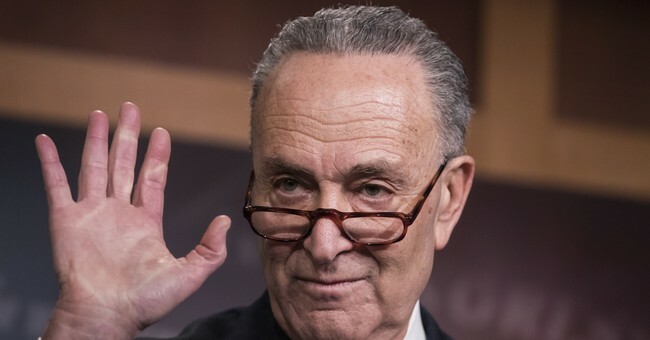 Schumer claims McConnell made an "agreement" in exchange for Democrat votes on the issue. Meanwhile, the White House is rejecting a re-introduction of the Flake-Graham-Durbin proposal and arguing it doesn't include sufficient border security or interior enforcement. It also fails to end chain migration and the Diversity Visa Lottery Program. "Rather than address these three essential priorities, the Flake-Graham-Durbin proposal fails to enshrine into law these baseline immigration reforms, which were deemed necessary and essential by the very people responsible for enforcing and administering our immigration system every day," the White House released in a statement. Congress has 17-days to find a deal on DACA, which is again being tied to a temporary spending bill, or face another shutdown.